This half-day personal branding session was all about taking portraits of Florence wedding planner Simona Cappitelli while she was working her magic during an actual wedding. Branding photography really is about showcasing what my clients do and who they are, in a setting that in the most real and beautiful way conveys the idea of what it is they can do for their potential clients. Much thought goes into my half-day branding photography sessions, from an in-depth consultation via skype to the creation of mood boards, to location scouting so that in the end, your photos will reflect your personality, expertise, and unique gifts as a creative and entrepreneur. So much more than just headshots! 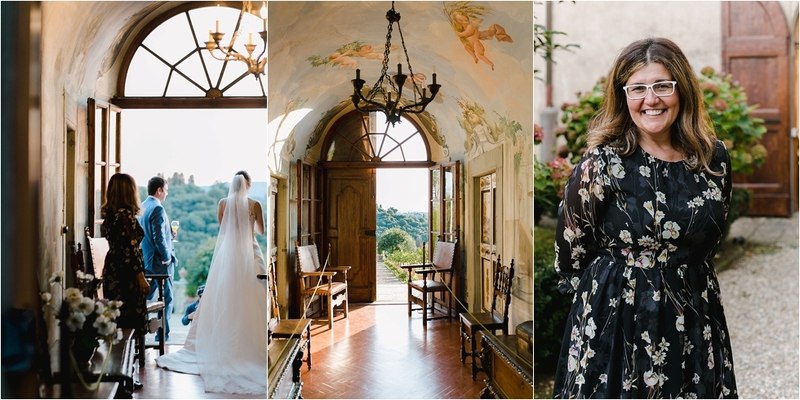 For Simona’s branding photos, we established Villa Medicea di Lilliano as the perfect backdrop, not only because it’s gorgeous but even more so because Simona LOVES planning a wedding there, as one of her most adored venues – which means that in having this exact venue in the photos will help attracting even more of her dream clients who share her love for Tuscan elegance and small, intimate weddings. During our session, Simona was in her element, adding the finishing touches to the décor, lighting candles and lending a hand to the bride when she needed assistance. Meanwhile I blended into the background, observing from the sidelines to create a portrait of professional Simona at work and capturing the details of real moments as they naturally flow and unfold. In a second session, we took some natural shots of Simona in the park and by the fountain, a place that’s very meaningful to her as she played there often as a little girl, one that allows her clients to see a bit more of the personal side of Simona. Whether you are a wedding planner, artist or designer, showcasing your business with photos of you being at work or in your studio is an effective way for your dream clients to get to know and relate to you, helping them to book you easier and faster. Are you ready to take your business more seriously and to attract more of your dream clients via gorgeous new branding photos? Contact me now to book your free consultation about my branding photography services.